They call them “Junk Mares”. Yes “junk” as in debris, trash, worthless and possessing utility but lacking in substance. These are the horses of the nurse mare industry. The tradition of breeding mares to ordinary studs lacking any significant commercial value to induce lactation has been practiced for many years primarily by, but not limited to, the horse breeding/thoroughbred racing industry. Originally, these mares served to nurture rejected foals or those whose mothers died in childbirth; basically a benevolent thing which over the years has progressively deteriorated into a reprehensible industry as a result of the lucrative quest to breed the ultimate horse with rejection of the masses. Over breeding is now pandemic and has created an exponential rise in a most insidious disease called “horse slaughter”. Once the mares have foaled, they are leased out to highly profitable breeding farms to act as surrogate mothers to “expensive and promising” foals. You may ask why this is necessary and who is responsible? First and foremost, “The Jockey Club” and their archaic rules are accountable for these crimes. In essence, a quality highly valued mare who has produced champion foals in the past is repeatedly bred with equally impressive stallions to maximize profits. Given that the gestation period is 11 months and after giving birth she is in heat 7-10 days later she must be re-bred to ensure she produces another potential champion foal in 11 months. This unremitting cycle pushes the mare to extreme biological limits, clearly equine exploitation at the hands of the negligent thoroughbred industry. Since the mares can only be impregnated naturally and not by artificial insemination, for example, they must be transported to the farm housing the stallion to be live bred. Due to the value of her foal and insurance purposes the foal cannot travel to the breeding shed with her. Having left her own foal behind, she will now nurse the “privileged” thoroughbred and at the end of her “duty” be re-bred to resume the chronic cycle. Many of these mares are not well cared for and just as the thoroughbred and PMU mares they are relentlessly pushed beyond their natural physical capacity. Effectively “pack mules” of a malignant industry rife with overzealous greed. Perhaps in the “good old days” of racing prior to the explosion of over breeding this was legitimate and respectful protocol but in today’s frenzy of unregulated breeding and unmitigated overpopulation of horses, it is no longer viable. Foals, the unwanted byproduct of racing's nurse mare practice, are simply killed by clubbing or other means. Some are starved to death and others are sold to the tanning industry for their hides, also known as “pony skin”. Since it is illegal to send foals under six months to slaughter, they skin them to manufacture high-end leather products. But wait, what about the nurse foals? Looking more closely at the situation, one realizes that the real tragedy of this procreative process is not only the fate of the nurse mares but more piteously their foals – the unwanted and forgotten by-products; simply waste for disposal. Similar to the fate of the foals of the PMU industry, these innocent creatures face an even gloomier destiny. They are more or less taken from their mother immediately at which time the horror begins. Many are simply killed by clubbing or other means, some are starved to death and others are sold to the tanning industry for their hides also known as “pony skin”. Since it is illegal to send foals under six months to slaughter, they skin them to manufacture high-end leather products. Some are lucky and are rescued by horse advocacy groups but like the PMU industry some eventually make it to the slaughterhouse ultimately ending up on a high-priced foreign menu as a delicacy item. Are you unwittingly carrying a “pony skin” handbag or sitting comfortably on a couch made of “Cordovan” leather – the product of nurse foal hides? What is really overwhelming to think about is the state of thoroughbred breeding practices in this day and time and what this implies in terms of these by-product foals. Ok, let’s do the math; 45,317 + 4500 (an average estimate) = 49,817 mares bred in 2009. Looking at the worst case scenario, this means there are about 50,000 mares and 50,000 by-product foals on average per year that the racing industry is accountable for. This is an atrocity in light of their claim to be a reputable and responsible organization. Well, it is dedicated all right; to the “prominent” thoroughbred owners and breeders and their bulging pocketbooks, certainly not to the welfare and safety of the horse. So, what can be done to end this poignant, thoughtless multi-million dollar enterprise that prospers on equine exploitation? Eliminating the need for live breeding and allowing artificial insemination would essentially eradicate the necessity of nurse mares. It is highly unlikely this would have an adverse effect on the integrity of the thoroughbred foals. Stop breeding the mares annually. 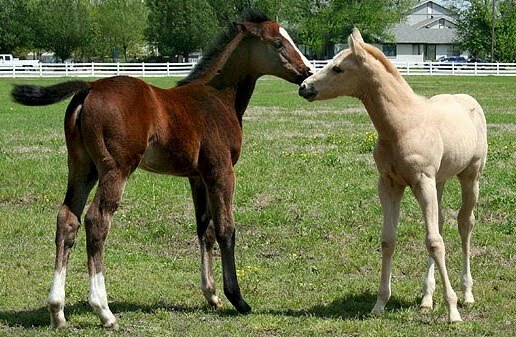 There are surplus race horses as it is and both the mare and her foal would benefit biologically as well as psychologically. Provide the foal with an alternate source of milk, for example a milk replacement formula. Many of us, years ago were raised on formula rather than mother’s milk without disadvantage. Campaign for elected legislators to pass humane laws to financially supporting horse advocacy organizations. Well, we all know how hard that is! Raise public awareness to condemn The Jockey Club and the tactless breeders and owners who promote or at least abide by this antiquated policy. Awareness of this industry has in fact increased but this does not stop the rampant over breeding we continue to witness. Although horse racing is not the only contributor to the nurse foal industry they are the major player in this “game” of death. Horses are dying in anguish simply to line the pockets of the wealthy. Will the abuse and neglect ever end? The most endangered species of all, the innocent. All in the name of money, when did a living breathing life become so invaluable? Sad state of affairs when rescues need to “buy” the byproducts of the greedy, that’s right they have to pay for the thrown away babies to save their lives, no money they die. I just recently heard about this, it is unthinkable to club these poor babies or sell their precious skin. The horse race industry is monstrous, to the race horses themselves and the poor little foals. And I,for one,am really tired of hearing that all this “overpopulation” of horses is as the hands of the backyard breeders. REALLY?? that’s about stupid. Us ‘backyard breeders” as we’re called (the responsible ones anyways) are only turning out 1 or 2 foals per year, or ever other year (I’ve only got 2 foals, and I’m quitting because I don’t believe the horse world needs any more horses to perpetuate the slaughter industry). Put those tiny numbers up against the “industry breeders” who will breed 10+ foals to find, maybe, one – now THAT’s outrageous and irresponsible. Then, most of those poor little “loser” foals get tossed aside and end up where they should NEVER be! The tragedy and crisis we face is derived from PURE, unadulteratded GREED! All forms of animal racing needs to be stopped!! Our beautiful horses and dogs were not put on this earth to be entertainment for pathetic idiots who have more money than wealth. These racing people are no better than the losers who beat baby seals to death for their fur. It is time for these people to be exposed for the disgusting pieces of filth they are. P.S. Rodeos also need to be stopped as well. Coming from a western state I have heard of the abuse these animals receive. And for what – so a “cowboy” can show off his supposed talents and the audience can get a cheap thrill. It is beyond me why so called humans always have to put animals in competition. Why not just enjoy them in their natural surroundings and witness the magnificence of horses running and playing and dogs that jump and play without a race track. Are they really, as a whole, though? I have no doubt there are good people in the industry and there is solid evidence of some who excel in this regard. But why then do they continue to breed, breed, breed and run these horses fanatically at such young ages when their musculo-skeletal structures are still developing? Through all of this in-breeding they have weakened them to the point they are not built for endurance but rather speed, all at the cost of increasing break-downs on the tracks – some of which are never reported. This can in no way be regarded as responsible or improving the health and safety of the horses. If anything this has increased over time, not decreased. If you look at the statistics you will see that breakdowns have increased over the last 5-10 years. Go figure. Although occasional high performance animals are produced, inbreeding generally results in an overall reduction in performance. This reduction is manifested in many ways. The most obvious effects of inbreeding are poorer reproductive efficiency including higher mortality rates, lower growth rates and a higher frequency of hereditary abnormalities. This has been shown by numerous studies with cattle, horses, sheep, swine and laboratory animals. The extent of this decrease in performance, in general, is in proportion to the degree of inbreeding. The greater the degree of inbreeding, the greater the reduction in performance. Also, the numbers tell the story…do we really need 4,000 to 5,000 foals born each year for the racing industry? Many of these animals go to slaughter simply because they don’t perform as expected at the track. Why do you think there are so many TB horse rescue operations? The industry indeed needs a major overhaul. Unfortunately much of it is driven by greed. Compare it to the greyhound industry and you will find many parallels – and where is that today? Don’t get me wrong. I love horse racing and the beauty and grace of the horses but I don’t think they are doing enough for the horses. What they sorely need is a central governing body with major overhauls in their breeding, drug and racing policies. And it is true that many tracks are well aware of how the sport has fallen out of favour with much of the population, reason being is that they are not making enough MONEY!!!! It is shameful as far as I am concerned but I agree that to clean up this corrupt “Sport of Kings”, which is no longer I’m afraid, we need to speak out. But then again remember we are yet again at the hands of the wealthy who in some cases make their beds with corrupt politicians who, incidentally, should be sleeping with the fishes!!! It’s all about money or lack thereof. I don’t agree with a/I of horses, Surrogate mares so high dollar mares keep producing eggs nor taking foals away from their dam’s in less then a year, I also don’t agree with 2 and even 3 year olds racing as is the case at this time BUT the thoroughbred racing organizations are the first and best so far at stepping up to the plate with revised regulations to improve horses lives, They are not perfect by any means and still have a long way to go regarding enforcement but are on the right track and are listening to us out here. They have to, they recognize that we can either be their life blood or their coffin makers. Lets work with them and keep our input to them logical and workable for the time we are in. Things will improve and the highest form of horse competition in the world will be the first ones to make it happen. sooner or later the low life’s at the AQHA ,APHA, Arab assoc, and especially the gaited horse world will have to follow. It takes time to change a world that has been doing things as they have for 200+ years of organization, you all know nothing happens overnight. Support the racing organizations, they may not seem it but they are trying. I know I have been watching them for years and going to races, I have seen the changes and improvements over the last 10 and especially last 5 years personally. Keep your comments coming to them, congratulate them when they make progress and be constructive when you have ideas for them to improve. They are listening. Just another example of a good rule that lowlifes found a way to get around … someday, somewhere, we will pay for our abuse of God’s creatures. Every day I look at the neat, overall pattern of pinfire markings on my TB mare I curse the racing industry … those marks were made before she ever raced. Bastards. I pray that these last 10 years of her life, spent in the pastures with her final foal, my Anglo-Arab mare, have helped to erase memories of her earlier life. Yes, you are right, artifical insemination would not end the plight of the actual thoroughbred mares but you have to start somewhere. And yes, they may still use the nursemares to avoid “stressing out” their mares but I would think for the most part, taking the foals away from the mares must be traumatic in any case and unnatural. But as you say, these people probably don’t really care either way. The point is, the racing and breeding industry must stop all of these cruel and debilitating practices to “all” of the horses involved. In- and inter-breeding practices for genetic perfection merely leads to mutations in genetic code that invariably cause abnormalities and infirmities…this fact is well-known both in human and animal reproduction. What is needed are laws to govern this industry, not just recommendations and guidelines from only those who profit from it. Are there NO depths these fools will NOT sink to?